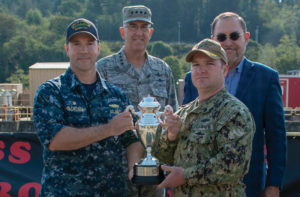 The blue and gold crews of the USS Alabama, a ballistic missile submarine, were presented the Omaha Trophy, sponsored by the U.S. Strategic Command (USSTRATCOM) and the USSTRATCOM Consultation Committee. In 2017, the USS Alabama also received the 2017 Commander, Submarine Squadron 17 Battle Efficiency “E” Award. From left to right are Cmdr. Jeffrey Yackeren, Gen. John Hyten, Cmdr. William Filip and Steven Martin. Homeport for the submarine is Bangor, Washington. Adams and Reese was recognized in The Best Lawyers in America 2019 with the greatest number of lawyers from a single firm listed in the Mergers and Acquisitions practice group for its Mobile office. For a fourth consecutive year, Baker Donelson has been certified by the Women in Law Empowerment Forum as a Gold Standard Firm. Bloomberg Government released its annual BGOV200 listing, ranking the top federal contractors based on prime contracts awarded in fiscal 2017. The Alabama companies making the list were BL Harbert International at no. 40, Caddell Construction Co. Inc. at no. 56, Torch Technologies at no. 155, Redstone Defense Systems at no. 186 and Colsa Corp. at no. 196. Blue Fish was named the Mobile Area Chamber of Commerce’s 2018 Small Business of the Year. Foley Sports Tourism has been recognized by USA Volleyball Gulf Coast Region with the Robert L. Lindsay Meritorious Service Award. The Land Trust of North Alabama has had its accreditation renewed by the Land Trust Accreditation Commission. Maynard Cooper was recognized as a Band 1 Law Firm in the Chambers High Net Worth 2018 Guide: The World’s Leading High Net-Worth Advisors. MotionMobs, of Birmingham, has been selected as a finalist for the Dream Big Small Business of the Year Awards, presented by the U.S. Chamber of Commerce in its 2018 Small Business Summit. It is one of three companies competing in the Women Owned Business Achievement Award category. Road & Rail Services Inc. has received the Processor of the Year Performance Excellence Award for 2018 and the American Honda Award for Superior Quality 2018 from American Honda Motor Corp. The UAB School of Dentistry has been named one of the world’s top 25 dental schools by ShanghaiRanking’s 2018 Academic Ranking of World Universities.